Rich Picarelli gives us some quality face time on a summer day at Antrim, NH's Home and Harvest Days, and tells us what's waiting for us this winter at Granite Gorge, in Keene, NH. He knows the park inside and out and he drives the coolest company car ever! It's a '71 VW bus in lime green that he and a buddy rehabbed for the Gorge. Check out his rail riding vids onYouTube here and more! Video by Lauren Traub Teton, for SnowboardSecrets.TV. Monday (at least for Lauren) started out with Dave Bryson doing a spiritual reading, then the Group Invocation/Circle Dance. Yoga of the Heart/Tantric Breathing with Beth Nolan brought participants into a new realm of energy. Then topped off with Vibrational Sound Massage with gongs and singing bowls. Sue from Edison tells about the late night show last night and compares this Evolvefest to years past. Help me out with band names who appear here! Post a comment and tell me who you are! A very happy Dave Bryson gives a short interview after the Evolvefest wraps at an impromptu after party in the staff food tent where everyone was invited to share the leftover food. Thanks Dave, for a wonderful festival, Evolvefest 4. Videos by Lauren Traub Teton, exclusive for SnowboardSecrets.TV and Twifties.TV. Raquy and The Cavemen start the day with their irresistible drumming while a dancer twirls ecstatically. Evolvefest Founder Dave Bryson shares the good news that the festival is front page news in the Sunday Herald. The Yoga Stage has a full roster of music and dance including The Pranadhanas Yoga/Dance group. Help me out with the names of the other bands PLEASE!! Leave a comment below on YouTube! See Part 1, Part 3, the Sneak Peek Video, Unexplained Bacon, The After-Hike, and the rest. Video by Lauren Traub Teton, exclusively for SnowboardSecrets.TV and Twifties.TV. Evolvefest in Vernon, NJ is a 4-day music and yoga fest for all ages. We had a PERFECT time there! See this video and you'll understand why. Here you'll see the bands: Telesma, and The WELL on the main stage. Then for the Late Show down at the Barn, the bands: Rinse Repeat, Spiro, and Keitchos Peachos. Plenty of dancing. Meet our styley friend Mick, creator of a cool light stick rhythm dancing device. See Part 2,3, Unexplained Bacon, and The After-Hike. Evolvefest was fantastic this year! You can experience it here! This reel gives you tasty tidbits in less than 3 minutes. Then you can view the longer videos on SnowboardSecrets.TV and Twifties.TV. Here you'll see Raquy and the Cavemen, Dave Bryson hosting, The Pranadhanas and their YogaDance, Vibrational Sound Massage with gongs and singing bowls, Eroc from Unexplained Bacon doing an impromptu Michael Jackson tune at his camp site. Timmy Grins of NY's Finest Italian Ices handing one over, and more more more...! Videos by Lauren Traub Teton. NESRA New England Skateboard Racing Association holds it's 3rd event this season and ever, on July 11, 2010. New skaters came out as well as seasoned old-school veterans for the slalom races in this friendly homestyle competition. See the newest event, banked slalom with a JUMP in the course! Dr. Dan P. hosts the video and the race. Carol and family, what a wonderful lunch, thanks again! Skateboarders love FOOD, especially delicious FREE FOOD! Rick Floyd, we missed you, but soldiered on. Video sponsored by Flexmeters.com, the skateboard and snowboard wrist guards designed by a doctor and proven to reduce wrist injuries. Video by Lauren Traub Teton, exclusive for SnowboardSecrets.TV. Experience the 9 wild features that we cross on the Adventure Tower at New York Zipline Adventures, at Hunter Mountain, NY. Lauren has a Twifties adventure! And says "this tower is no joke!" By Lauren Traub Teton exclusive for Twifties.TV and SnowboardSecrets.TV. 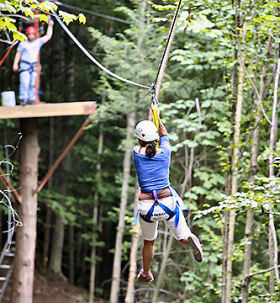 New York Zipline Adventures at Hunter Mountain - Feel the Canopy Tour! Feel the experience of riding the Canopy Tour in this video at New York Zipline Adventures, Hunter Mountain, NY, in the Catskills.It's just like BEING THERE! Video by Lauren Traub Teton and a friend exclusive for SnowboardSecrets.TV and Twifties.TV. See more great vids there too! Join Lauren and her crew of Twifties as they reveal footage of the inaugural first days of the New York Zipline Adventure Tours at Hunter Mountain Ski Resort,at the largest canopy tour to date in the US. Two hours from NY City in the Catskills, the first two phases of this project will open to the public in June. The third and final phase will open later in summer 2010. NYZAT will have two separate Zipline tours and the Adventure Tower challenge tour for all ages, ability levels and courage. The three courses will total nearly 5 miles of ziplines (some nearly 600’ off the forest floor and over 3,000’ long each) along with sky bridges, platforms and additional challenge elements at the Adventure Tower. Guests will be accompanied on tours of up to 2.5 hours by professionally trained guides. The facilities will operate year-round, utilizing Hunter’s chairlifts, terrain and base lodge.